During the past decade biosensing has become one of the most rapidly developing area of fundamental and applied research. 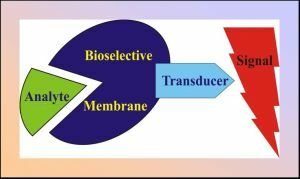 Biosensors are analytical devices in which biological recognition element (for instance, enzyme) is combined with signal transducer. Molecular recognition and specific association of bioselective element with analyte in question is followed by the formation of measurable signal proportional to analyte concentration. Regardless of signal transduction principle an important point in biosensor design is a proper choice of enzyme immobilization support. Physicochemical properties of supporting medium play an essential role in determining the enzyme catalytic activity, thereby affecting sensor performance. In this regard self-assembled lipid structures are particularly attractive. The use of liposomes in biosensor design offers a number of advantages. First, the shell of liposomes is a lipid bilayer which provides a flexible, membrane-like environment allowing the activity of the surface-bound or bilayer-incorporated enzymes to be retained at a high level. Second, a variety of reporter molecules, for instance, sensitive dyes may be entrapped in the internal aqueous compartment of liposomes and involved in signal amplification. Third, affinity of liposomal membranes for various agents can be modified within a wide range by varying lipid bilayer composition, thus preventing undesirable chemical interference. Fourth, liposome-based sensor can be inserted into a cell without membrane damage, ensuring a non-invasive intracellular control. Finally, liposomes are promising systems for development of novel immobilization supports with improved properties including supported lipid membranes or polymerized lipid vesicles entrapped into gel beads. A vast sensor research area where the use of liposomes seems to be promising involves glucose biosensing. A widespread glucose sensing scheme includes monitoring the reaction of glucose oxidation catalyzed by glucose oxidase (GOx). For a purpose of selecting chromo- and fluorophores most suitable for designing the absorbance- and fluorescence-based optical glucose biosensors we have tested a series of organic dyes and fluorescent probes including 2,6-dichlorophenol indophenol, methylene blue, pyronine G, orange G, bromocresol purple, congo red, bromochlorophenol blue, methyl green, janus green, oil red, squaraines K8-1600, K8-1350, phenazine and pyridine derivatives for their sensitivity to enzymatic reaction catalyzed by glucose oxidase. Mediator dyes 2,6-dichlorophenol indophenol, methylene blue, janus green, oil red, and pH-indicators neutral red, bromocresol purple, bromochlorophenol blue were found to be most appropriate for elaboration of absorbance-based glucose biosensors. pH-sensitive squaraine dyes K8-1350, K8-1320, K8-1762, 1,2,3-triazole-[4,5-d]phenazine and pyridine derivatives 4-(n-dimethylaminostyryl)-1-hexylpyridinium and 4-(n-dimethylaminostyryl)-1-dodecylpyridinium displayed properties favoring the use of these compounds in fluorescence-based glucose biosensors. The applicability of liposomal systems to immobilization of GOx and reporter components of glucose biosensors has been evaluated. Positively charged lipid bilayers composed of phosphatidylcholine and cetyltrimethylammonium bromide appeared to provide GOx environment being most favourable for retention of enzymatic activity. The structure of GOx-lipid complexes has been characterized using light scattering and resonance energy transfer techniques.